The beginning was good, but then . . . 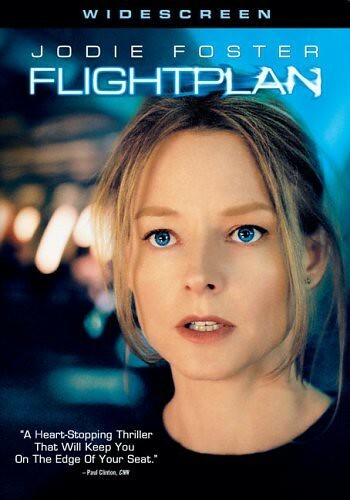 The trailer for Flightplan had me excited about seeing the film. Sean Bean. Jodie Foster. Action in tight places. Sounds like a great thrill ride. And it was. For awhile. Flightplan gets off to a great start. Jodie Foster is Kyle Pratt (the role was originally written for a male lead, and when Foster came on board, no one bothered changing Kyle to a woman’s name), a designer of fancy passenger airplanes whose husband recently and mysteriously fell to his death from their apartment building in Berlin. Now Foster and her daughter are taking the husband’s/daddie’s casket back to the States for burial. It’s a long flight. And three hours into it, Julia, the daughter disappears. Foster becomes frantic when she can’t find her, and the suspense begins to build. None of the passengers saw the little girl. Ever. And the captain and flight attendants begin to believe that she was never on the plane. Even Foster begins to wonder if she is losing her mind.